C-Line | C-Line Write-On Small Parts Bags - 5" x 3" - Poly - 1000 / Box"
Store all sorts of not-so-easily-stored items in these poly bags. 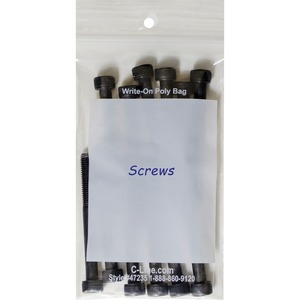 Perfect for small items that are easy to lose, these poly bags are waterproof and airtight. Clear design makes contents easy to identify. Large white panel lets you write content descriptions directly on the bag for easy organization.